Called the Shweeb, this cool idea of transport from New Zealand is grabbing eyeballs and the attention of people across the globe. The idea of a personal transportation pod may be rather fascinating but the fact that it can take you distances by simply employing pedal power is even more attractive as a proposition. The designers who developed the Shweeb are looking at this as an environment-friendly mode of transport. By leveraging a monorail system to guide users along a path, the pod is powered by the rider’s ability to pedal across distances. Thanks to the special chain system, the pod takes only half the energy required on a bicycle to travel. The designers have taken a step ahead and linked Shweebs to enhance performance and cut down on the impact of air resistance. With the approaching CES 2016, we can see more being done on the concept front. Take Rinspeed for instance. Their Etos Autonomous concept car is absolutely love-worthy and packs an added punch to the experiences it promises to deliver. While self-driving is commonplace among new releases, the Etos takes a bold new approach where it focuses on the comfort and experience of the driver and passenger. The car is built around the flagship BMW i8 chassis and drivetrain with an addition of several other features. The retracting steering wheel from ZF TRW is a practical solution for space-saving. Other exciting additions to the interior of the car include the pair of curved 21.5-inch HD widescreen displays, great connectivity and human interactivity interfaces on the dash as well a gesture and voice recognition. On the outside, the doors come with vertical hinges, 8 exterior cameras keep an eye out on the surroundings to ensure no blind spots and of course, the amazing drone that is accommodated on a landing pad that is studded with 12,000 individually controlled LEDs. Ever watched that piling mound of Tetris blocks and wondered if you could make a shape out of it all? Well, I did. But for those who want something a little more realistic for their taste there’s always some concept art or the other. In this case, Universe Architecture have a ready-to-distribute house that is actually based on the Tetris block idea. Each module of the house has been design in a manner where it can link with the other module. That way you can design and customize your own home by simply adding these dwelling blocks together. How cool is that? 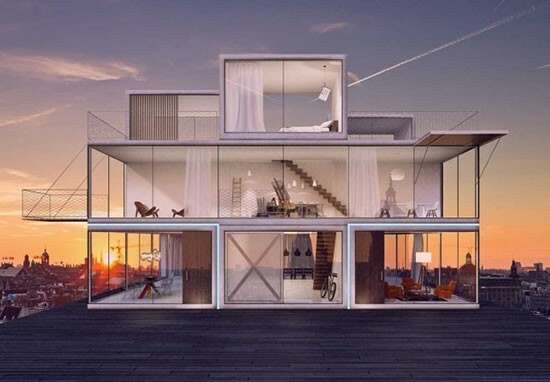 The exteriors are much too transparent for our taste but the idea of having a modular home that can be scaled and expanded based on any random whim. So, if on one fine day you decide that your bedroom needs a balcony just speak the word and voila, you’ll have one attached as if it were adding a swing. Apple sure gives you technology solutions in a number of shapes and sizes. So, it isn’t surprising if you have a work desk that has done away with the erstwhile clunky laptop and replaced it with a sleek new iPad. There’s got to be an iPhone that complements the ensemble. What you do lack is a workstation that is ergonomically comfortable for you. 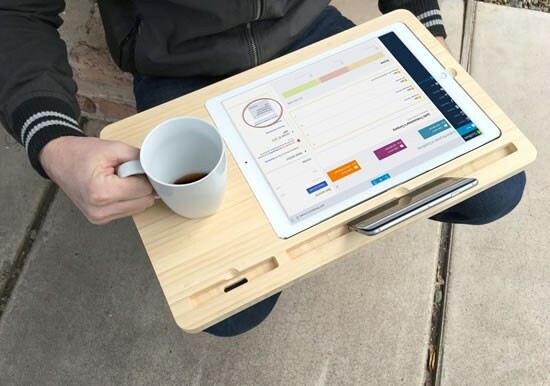 Keeping in line with the minimalist wood-finished looks of the Apple Stores the Canvas Smart Desk for the iPad Pro and the Surface Pro makes for a great solution. The iPad Pro, with all its large screen size is possibly heavier weight would need something like this to get around. 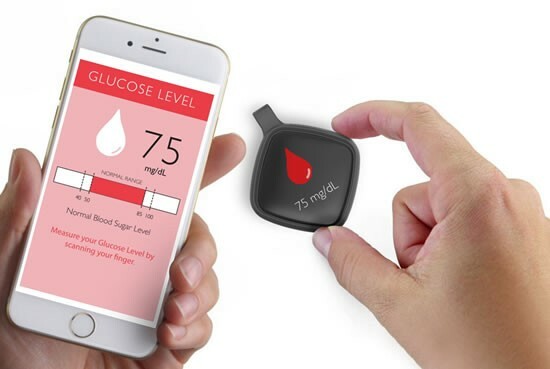 In what could be a revolutionary attempt to enhance the lives of diabetics, this amazing wearable device could be just the answer. Flore is a wearable device that performs multiple functions that not only keep a check on the glucose levels of a diabetic but also acts as a trustworthy companion to enhance the quality of life of the patient. The device is extremely small in size and offers handy nutritional and physical activity updates. It is capable of consolidating all the activities that a patient undertakes and synchronizes with a smartphone to make controlling and monitoring extremely convenient. In addition to the patient, it also relays vital information to caregivers and the patient’s healthcare provider. Retina scanning wasn’t any less cumbersome than a trip to an ophthalmologist’s office. Thankfully, we have a solution that not only simplifies the process of retina scanning but also makes it incredibly convenient. All thanks to the Visuscout 100 retinal scanner is a brilliant introduction in a field that always demands quicker and precision results. The scanner can ensure that retinas are scanned effectively, without needing to move the patient. 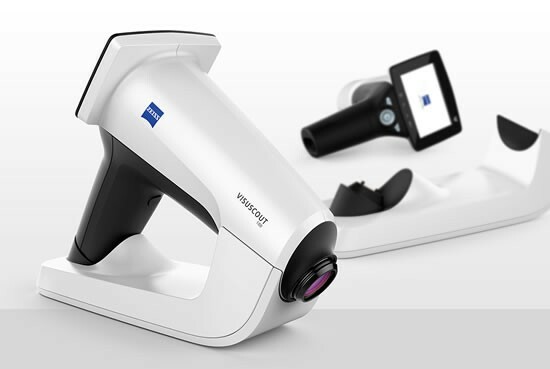 It leverages high-quality imaging for detection and monitoring of retinal disorders thanks to the sophisticated hardware and software included in it. Experts can now focus even on incredibly tiny areas. The non-mydriatic operation of the camera and the amazing auto-focus capabilities, the eyes do not need to be dilated. The John Hancock Centre in Chicago received a new addition in its midst and there’s so much to take in from what you can see. 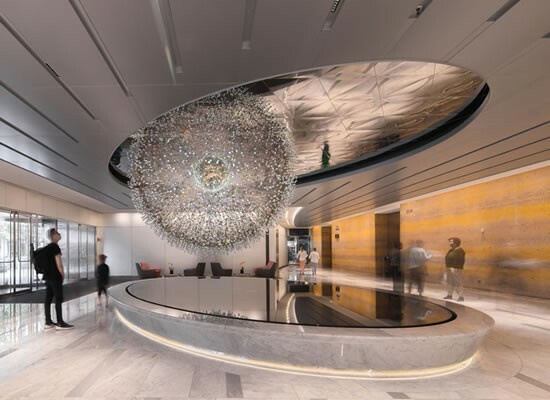 Artist Wolfgang Buttress has completed the sculpture called Lucent that looms above the lobby area. 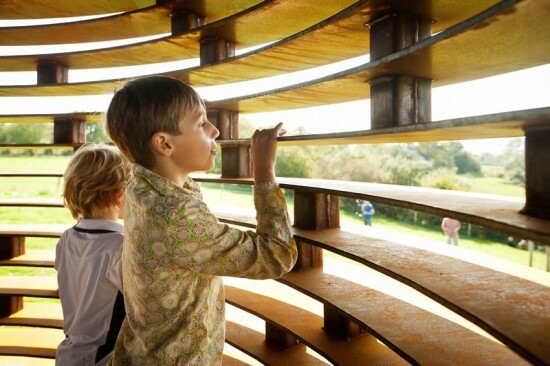 The name of the sculpture has been derived from Latin Lucere (which means, ‘to shine’). As many may decipher, the structure resembles a star map and draws on celestial mapping research by astrophysicist Dr Daniel Bayliss at the Australian National University. The 4-meter diameter of the hemisphere is perforated with over 3000 holes that represent stars. It represents stars that are visible to the naked eye from the Earth’s Northern hemisphere. That’s not all, the artist has also embedded fiber-optic cables that emerge from the nodes, emitting a soothing light. The real magic is created by the hand-blown glass orbs that are attached to the nodes. 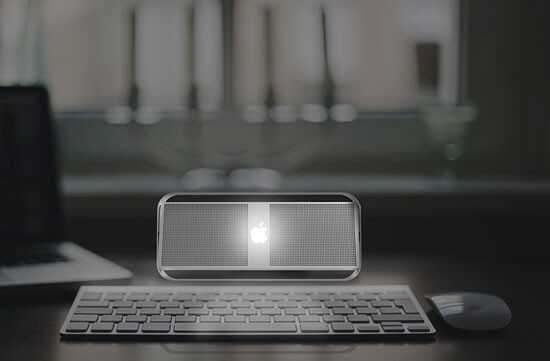 Apple have set the benchmark for design innovation and there’s no doubting that they’re leading the charge when it comes to enhancing quality of products through good looks and design. This astonishingly ‘Apple’ Radio device is testimony to this fact. It is made to promote and make Apple Music spread even wider. The device is capable of streaming live events from radio stations across the globe and also doubles up as a portable speaker with a pair of powerful 5.1 Dolby Digital Surround Sound output. The radio is nothing near fragile, thanks to the sleek-looking aluminum exterior that adds rigidity and an elegant look to the radio. The device has only one port on it. The USB-C port charges the device and acts as the connector to other devices as well. You can also use Bluetooth for that purpose. The frontal radio illuminates to indicate pairing. When you first look at the Auto Boat you’d think it is a simple, functional floating object that could run through the serene backwaters of a coastal waterway, a recluse away from technology. But no. That isn’t what the Auto Boat really is. In fact, it’s got some really high-end technology that inspires it to sail around town. It is the brainchild of Will Reed, a boat builder and Jonas Jongejan, a programmer. 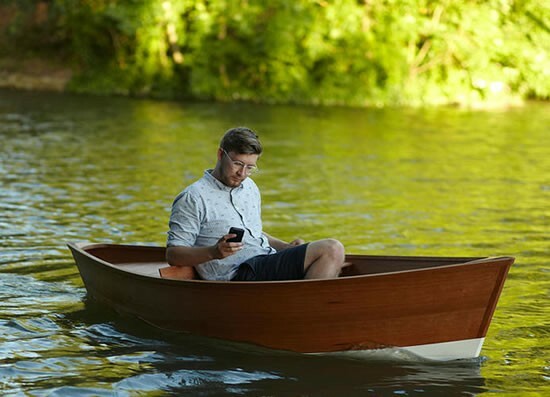 The one-seat boat is completely controlled by a smartphone. It leverages an app that creates a pre-determined route for the boat to follow. Then app would then affect the propulsion system to guide the passenger to their destination. Two small motors on either side of the boat and the in-built GPS system steer the boat to the destination that has been defined for it. The foundation of this brilliantly constructed church may be made of concrete but the rest of it is constructed from a generous volume of weathered steel. 30 tones to be precise. The steel panels are stacked horizontally with deliberate gaps between them. This gives visitors the opportunity to look into the church and in fact through it, as each side of the church is made with a similar arrangement. When placed at a particular viewpoint the church will seem to disappear from view and appear as a mere distortion to the landscape. 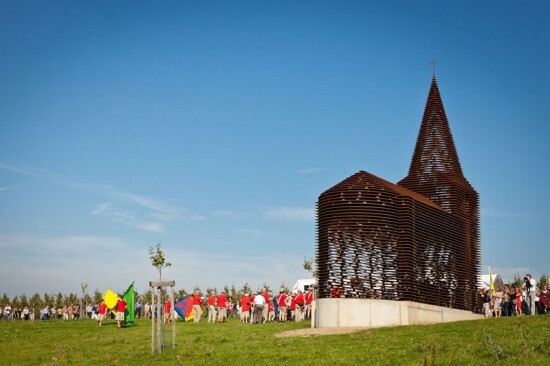 The church was constructed back in 2011 and is situated in rural Limburg, Belgium. 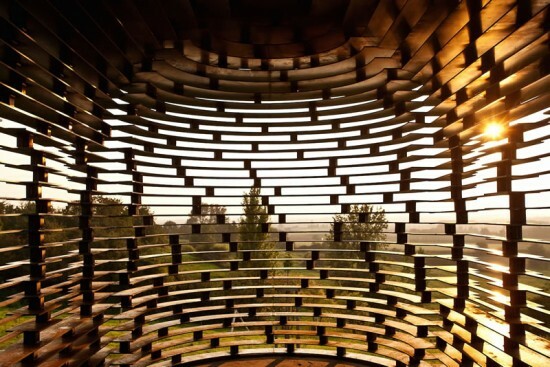 The project is the work of architects Pieterjan Gijs and Arnout Van Vaerenbergh of the Gijs Van Vaerenbergh studio. It is aptly named the ‘Reading Between The Lines’ project. 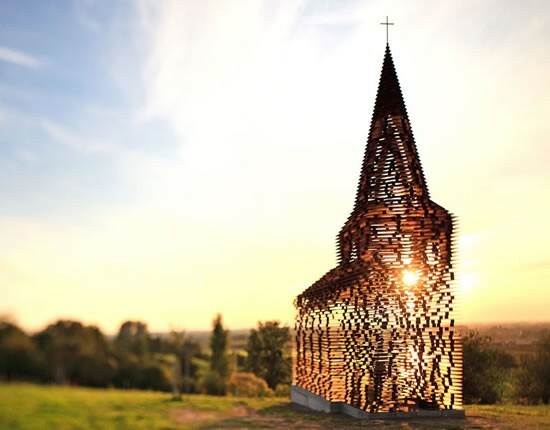 It is 10 meters tall and is built from 100 layers of stacked weathered steel, constituting an incredible 2,000 columns of metal.